On Saturday 20th April 2019 the sun will rise at 06:11 and will set at 20:25. It will be a mild day, with temperatures reaching around 18.5°C. Today is expected to be a dry day, with a very low chance of rain. There will be a gentle breeze in the air today, with a maximum expected wind speed of 13mph. On Sunday 21st April 2019 the sun will rise at 06:09 and will set at 20:26. It will be a mild day, with temperatures reaching around 19.9°C. Today is expected to be a dry day, with a very low chance of rain. It will be quite a breezy day, with a maximum expected wind speed of 17mph. On Monday 22nd April 2019 the sun will rise at 06:07 and will set at 20:28. It will be a mild day, with temperatures reaching around 21.6°C. Today is expected to be a dry day, with a very low chance of rain. It will be quite a breezy day, with a maximum expected wind speed of 31mph. On Tuesday 23rd April 2019 the sun will rise at 06:05 and will set at 20:30. It will be a mild day, with temperatures reaching around 17.5°C. Some moderate to heavy rain is expected, 9mm of rainfall is possible today. It will be quite a breezy day, with a maximum expected wind speed of 23mph. On Wednesday 24th April 2019 the sun will rise at 06:03 and will set at 20:31. It will be a mild day, with temperatures reaching around 11.6°C. Today is expected to be a dry day, with a very low chance of rain. It could be quite a gusty day today, with a maximum expected wind speed of 33mph. On Thursday 25th April 2019 the sun will rise at 06:01 and will set at 20:33. It will be a mild day, with temperatures reaching around 10.4°C. A few showers are expected, 3mm of rainfall is possible today. It could be quite a gusty day today, with a maximum expected wind speed of 43mph. On Friday 26th April 2019 the sun will rise at 05:59 and will set at 20:35. It will be a mild day, with temperatures reaching around 7.1°C. Today is expected to be a dry day, with a very low chance of rain. It could be quite a gusty day today, with a maximum expected wind speed of 28mph. Secluded style and luxury awaits you when you come to stay at Glandwr Country House at Tresaith. Glandwr is just a stone’s throw from the renowned sandy beach at Tresaith on Ceredigion’s rugged heritage coast, gracefully positioned in five acres of gardens and woodland on the village outskirts. 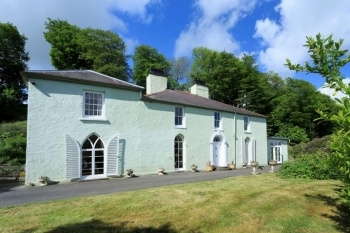 Glandwr is a Georgian Grade II listed house in Tresaith offering five-star holiday rental accommodation for up to 12 persons. With four double bedrooms, two twin bedrooms, stylish modern bathrooms, a stunning kitchen and three comfortable lounges plus games room, you will have plenty of space indoors and out to unwind and relax in this lovely location far from the grind of daily life. With the golden sandy beach at Tresaith within easy walking distance, Ceredigion’s Heritage Coast on our doorstep, the Wales coastal path is a stone’s throw away, inland foot and cycle paths can lead you to undiscovered places, Glandwr is an unrivalled location for your visit to west Wales.